the Walnut Hill Productions Website. Fred Willis was one of the first men the Bone Doctor encountered as he began to peruse the internet for TPO goodness. 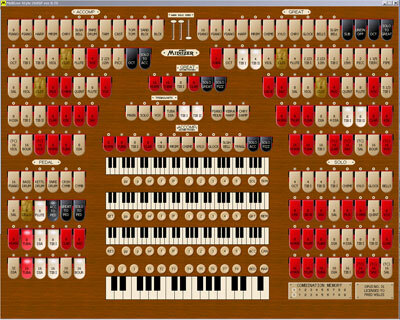 He is a member of the ATOS, the Walnut Hill VTPO and Theatre Organ SoundFonts groups on Yahoo! and also holds the office of Treasurer in the Walnut Hill Organ Club. Fred Willis at the Mighty MidiTzer. Always one with a kind word, his love for the theatre organ runs deep. 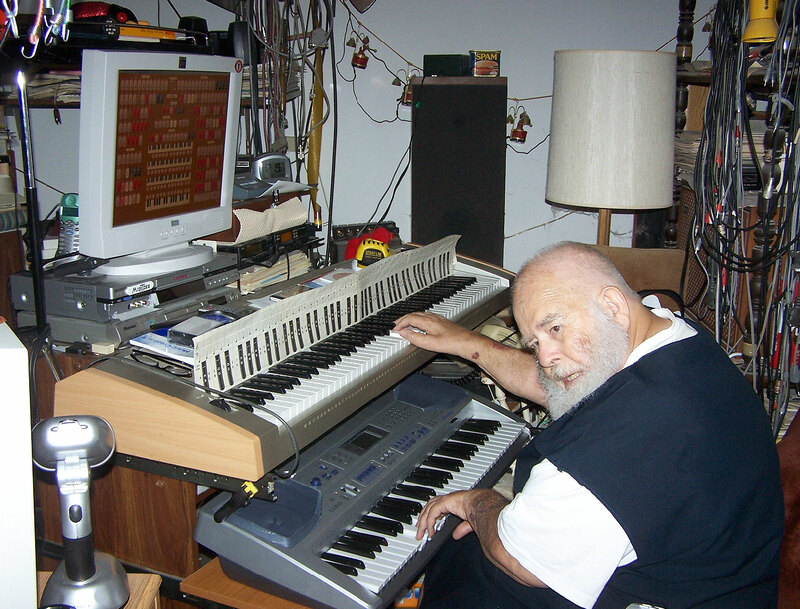 During many late night long distance telephone conversations, Fred has shared his immense knowledge base on the King of Instruments with the Bone Doctor. His wisdom is priceless. He is also a man of good humor and great love for humanity. Fred's Pizza and Pipes to Go! Fred is developing a mobile version of the Mighty MidiTzer so that he can travel with this wonderful instrument and show it off wherever he goes. We can see the fruits of his efforts in the photo above. Fred Willis' Mighty MidiTzer, Opus 31. 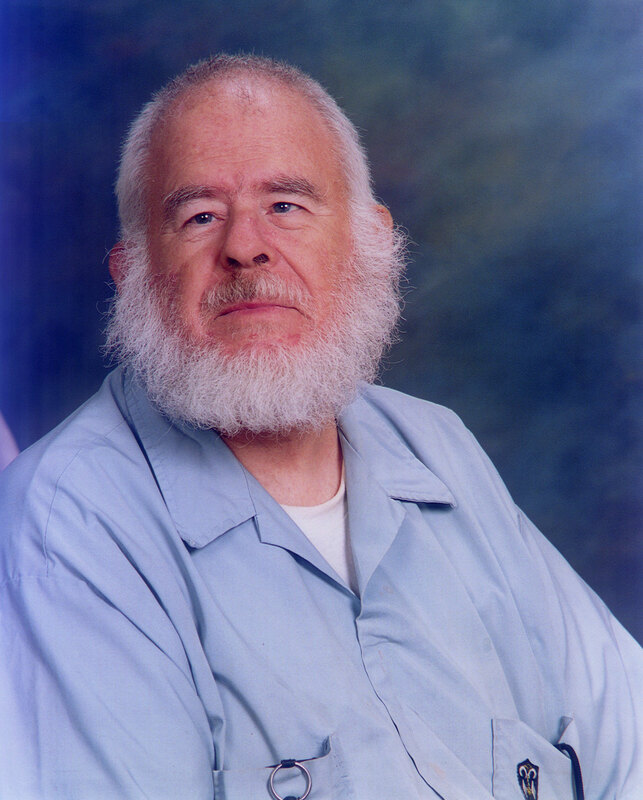 Fred made a large unsolicited financual contribution in order to send the Bone Doctor to the 50th Annual ATOS Convention held at Pasadena, California in 2005. We concider him to be a founding father of our group and site here at Walnut Hill and the Walnut Hill Organ Club. We can never thank him enough. Fred Willis has contributed an original Windows Desktop Wallpaper to our Desktop Goodies page called Mountains, Trees, and Pipes, see the thumbnail below. 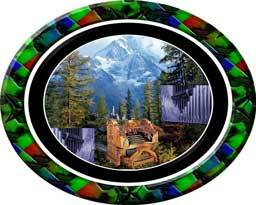 This is one of several he has made and posted in a personal photo album at the Webshots site. 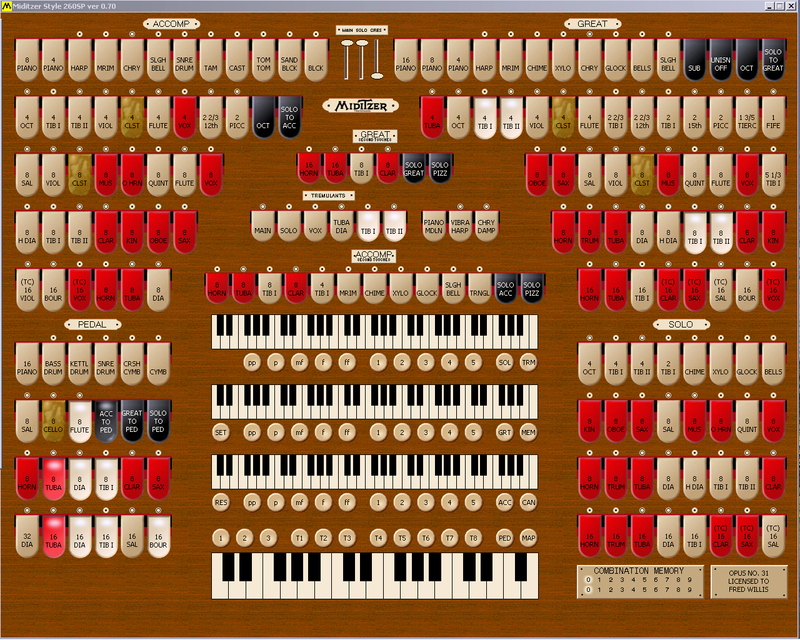 The Mighty Virtual Theatre Pipe Organ at Fred's house. Here is a picture of my MidiTzer'ized computer desk. Note the stop rail on the monitor. 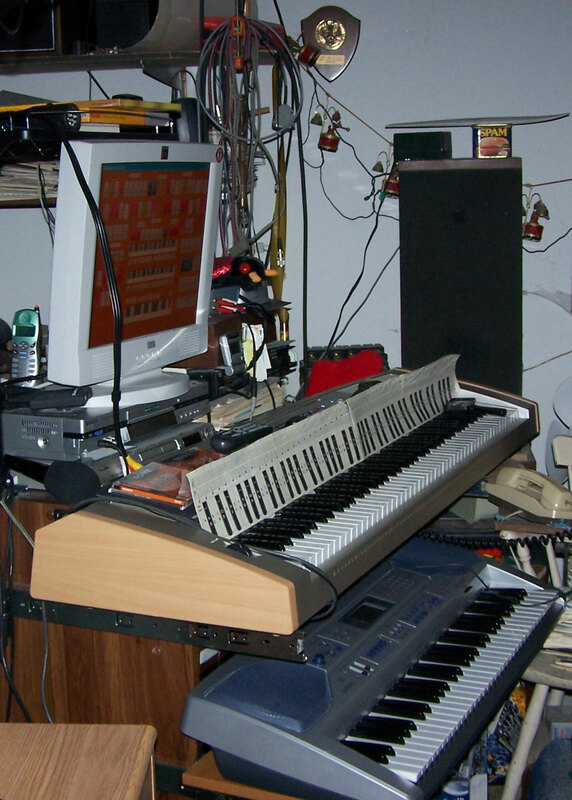 The upper keyboard is a Yamaha DGX-500 with 88 keys. 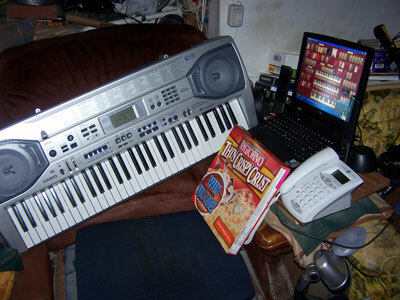 The lower keyboard is a Casio DT95-TV with 61 keys. 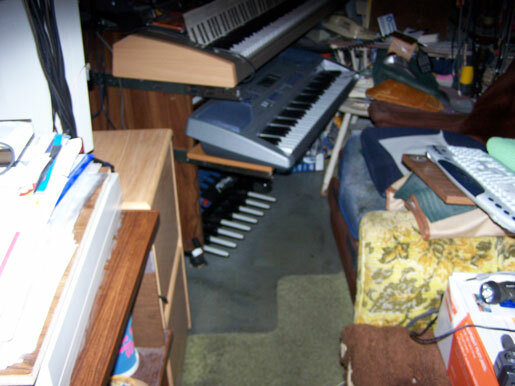 The pedals are by MIDI Step, with 13 keys. 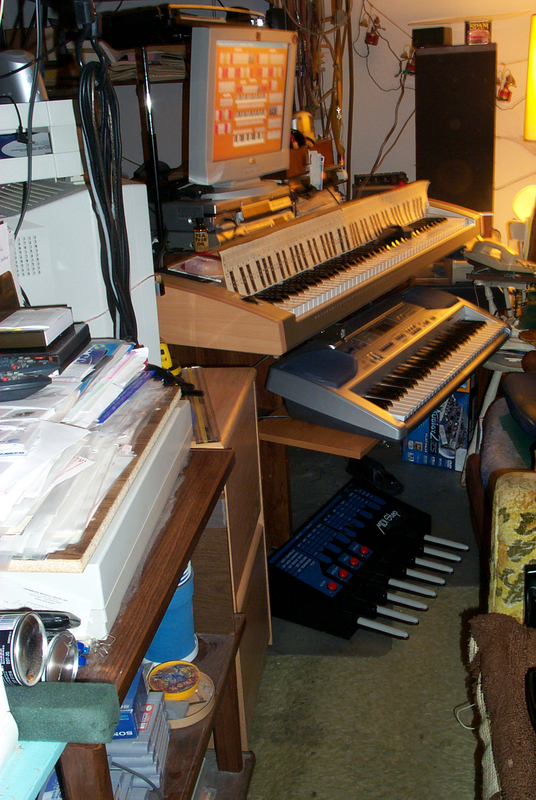 Each of the manuals and the pedals has a separate computer with a SoundBlaster Audigy 2ZS Platinum. The audio goes to a 16 channel mixer and then to a 5.1 sound system that has 2,000 watts of power, enough to fill my living room. 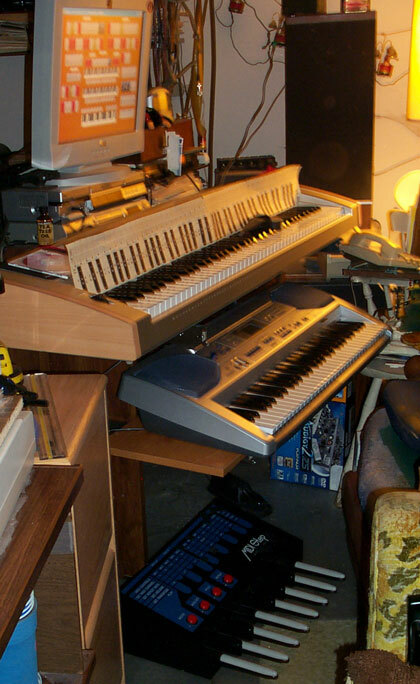 Fred's Mighty MidiTzer, looking at the Lower Keyboard. 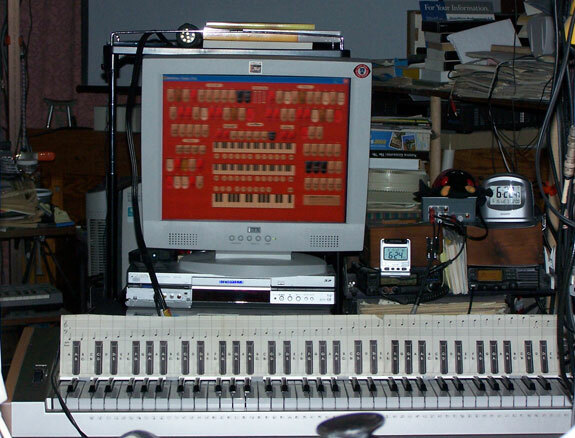 Fred's Mighty MidiTzer, looking at the upper Keyboard. Fred's Mighty MidiTzer, looking at the center flat panel LCD monitor. After a long wait, Fred Willis has sent in some music for our enjoyment. The first piece, entitled Moonlight Sonata was done in Cakewalk Pro Audio Tools using a mix of SoundFonts and VST Plugins. Playing time = 6:27, file size = 4.27MB, bit rate = 96KHz. Stay tuned for more great music from the Founding Father of Walnut Hill. Getting inducted to the Wall of Fame is easy! Who doesn't want recognition for their efforts with the Mighty MidiTzer? Now, you can get noticed on the Walnut Hill Wall of Fame! Folks will see your pictures and be able to go directly to your site by clicking on them. We hope to see many more inductees here in the days ahead as folks step out with their Mighty MidiTzers. So... Dust off those cameras and get snappin'. Also, if you have recordings or any other content you want featured, we can put those here as well. Email The Bone Doctor to find out how you can be among the ranks of those who are pioneering this Mighty Virtual Theatre Pipe Organ. Join TOSF and Walnut Hill VTPO and make your intentions known to all the folks in VTPO land. We are always glad to recognize those who make the TPO kingdom a better place!